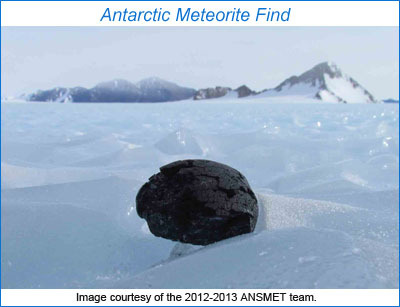 Since 1976 ANSMET, the Antarctic Search for Meteorites program, has been serving the cosmochemistry and broader, planetary science research communities by finding and recovering a continuous supply of extraterrestrial materials—specimens that, in fact, stimulate new research and allow rapid advancement of scientific knowledge and theory. As ANSMET Principal Investigator, Ralph Harvey (Case Western Reserve University), tells it, "These specimens are a reliable, continuous source of new, non-microscopic extraterrestrial material and support thousands of scientists from around the globe as they seek essential 'ground-truth' concerning the materials that make up the asteroids, planets, and other bodies of our Solar System." Meeting the strong scientific demand for new meteorite specimens is the integral and essential role of the U.S.-led field-based ANSMET program. Two parties went into the field this season: an 8-person systematic-searching party sent to the Larkman Nunataks and the ice fields adjacent to peaks in the Grosvenor Mountains, and a 4-person reconnaissance party sent to explore promising sites in the most southerly reaches of the Transantarctic Mountains. Now that the field work has ended, we welcome home the dozen team members and celebrate their success in bagging and shipping ~400 frozen meteorites to the Antarctic Meteorite laboratory at NASA's Johnson Space Center in Houston, Texas where these rocks from space will begin their journey into the hands and laboratories of scientists worldwide. Veterans of previous seasons are marked with an asterisk(*). Historically, ANSMET has been a cooperative effort among the U.S. National Science Foundation (NSF-Office of Polar Programs), NASA, and the Smithsonian Institution. However, ANSMET is in a transition to sole-source NASA funding for its field operations since NSF will no longer support the program directly after this coming summer. NASA and the Smithsonian Institution remain committed to sharing the responsibilities of classifying, storing, and distributing Antarctic meteorites to researchers around the globe. This website at the NASA Johnson Space Center discusses curation, characterization, and classification of the ANSMET meteorites: curator.jsc.nasa.gov/antmet/index.cfm. That's also the site to visit if you are a qualified scientist wishing to request a meteorite for scientific study. For more information see: the 2012-2013 ANSMET blog, the February 2013 Antarctic Meteorite Newsletter, and the PSRD articles Meteorites on Ice and Searching Antarctic Ice for Meteorites. Added March, 2015: NEW BOOK: 35 Seasons of U.S. Antarctic Meteorites (1976-2010): A Pictorial Guide to the Collection, edited by K. Righter, C. Corrigan, T. McCoy, and R. Harvey, American Geophysical Union and John Wiley & Sons, Inc., December 2014, 320 pages. Written by Linda Martel, Hawaii Institute of Geophysics and Planetology, for PSRD.